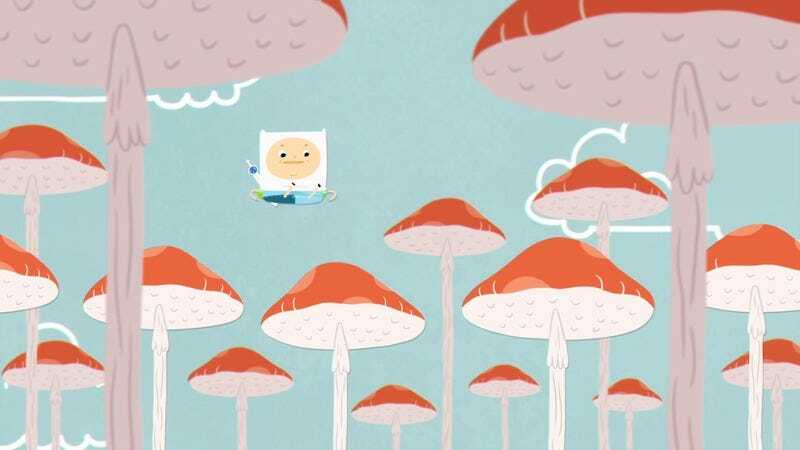 “Water Park Prank” is a simplistic episode of Adventure Time following Finn and Jake as they pull a prank on Ice King at the Wet Pipes Water Park, but it stands out because of the distinct visual style of David Ferguson, the Glasgow-based animator that writes, directs, and storyboards this episode. 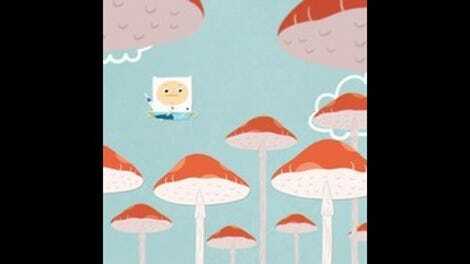 From the title card and credits, it’s clear that this episode will have a very different look from the Adventure Time norm, and Ferguson joins the ranks of artists like David OReilly and Masaaki Yuasa as an animator that drastically changes the style of the show by interpreting it through his singular point of view. Ferguson’s cutout-style animation makes everything very flat, but it has a lot of charm and character. It’s a lot of fun to see him interpret the Adventure Time cast in this style, and the characters’ cuteness considerably increases when they’re in their swim gear. (Jake in his little red Speedo is adorable, but I love Ice King in his retro striped one-piece bathing suit, complete with pink swim-cap over his crown.) Ferguson does great work embracing this show’s silly aesthetic for new characters, too, like the flying orangutans that populate the park and the anthropomorphized whistles that serve as lifeguards. This episode is simple, but it’s also very whimsical in an especially juvenile way. After Finn goes home to retrieve the shorts and underwear he’ll need after his swimsuit gets wet, he makes his way back to the water park by bouncing on top of mushroom heads while singing a song about underwear, then lands on a sign that explicitly says “No Bouncing.” Shortly after, Finn becomes the latest prey of the Daddy Sad Heads, small creatures that live in water and secrete a tear toxin that makes people cry uncontrollably, and in order to remove them, Finn has to find the strength to shake them off his body. He does this with the help of Princess Bubblegum, who forces him to visualize himself as a jester that needs to dance for a king. It’s all very silly, and it only gets sillier once Finn gets to the water park and a prank is hatched. While standing in line for a water slide, Finn and Jake overhear Ice King talk about how he’s going to turn the park to ice after this last trip down the slide, so they devise a prank that prevents him from going down the slide and ultimately gets him banned from the park for life. After planting a fake Jake in the viewing gallery by putting goggles on a kickboard that has his same shape, Jake makes his way into the slide and inflates himself so Ice King bounces back to the top every time he tries to make his way down. This could be seen as a metaphor for how Ice King can never make any forward progress in his life and always ends up in the same sad place, but it’s far more likely that it’s just Finn and Jake messing with Ice King because they want to ruin his plan. “Water Park Prank” doesn’t offer much plot-wise, but it’s visually rich and a welcome break after the intensity of the last two episodes. I appreciate the details in Ferguson’s storyboarding, like the expanding circle transition when Jake is saying “Oh,” using the shape of Jake’s mouth as the starting point of the circle that takes us into the next scene. When Ice King grabs Finn’s arm, a starburst radiates from the point of contact, a bold graphic element that has an even bigger impact thanks to Ferguson’s flat style. The story is forgettable but fun in an immature children’s TV way; it doesn’t try to be something sophisticated or deep, instead showing Finn and Jake being their typical goofy selves. It’s a standard Finn and Jake episode, but “Water Park Prank” shows the value of a strong, individual perspective, and I don’t think it’s a coincidence that the three most visually distinct episodes have all focused on Finn and Jake. They are at the foundation of this series, and when unique voices like Ferguson, OReilly, or Yuasa are given free rein to play around with this show, they work with the basics and find new ways to make the central bros engaging to the audience. As light and goofy as this story is, Ferguson makes sure to include a little bit of darkness by making Wet Pipes Water Park a converted chemical factory, complete with crumbling warning signs at the park’s entrance. This episode’s closing credits show all the people that have been banned for life, a group that includes characters like Terry, LSP, and Ricardio. I wouldn’t mind seeing more people play around with the end credits like Ferguson. I don’t know why Jake has to wear a Speedo at the water park, but I approve of that choice because I love the visual of Jake in swimwear.